The Kickstarter campaign for the eighth Evil Inc graphic novel will be over in two days. That means that you have a very limited time to preorder the new book, get some great rewards and support this comic in a big way — all at the same time! The book itself is going to be awesome. It’s clocking in at about 128 full-color pages. I’ve been feverishly finishing the extra never-before-seen panels to polish up the graphic-novelized presentation of the strip. It’s really gonna be great. If you’ve never seen one of my graphic novels, it’s more than a collection of the strips — it’s an entirely new reading experience. Scroll down this page for a little introduction to what I’m doing. Let’s not forget the rewards. Each pledge level comes packed with its own rewards — digital downloads of this book and previous ones, original art, discounted pricing on packages — but the simple act of participating in this Kickstarter brings additional goodies! For example, all of my backers are going to get my ridiculous laugh as a ringtone. And if we cross the $15K mark, I’ve got something extra special that you can’t get anywhere else — a complete beginning-to-end collection of my previous webcomic, Greystone Inn. Much of what you like about Evil Inc was initially created, experimented with, and developed in Greystone Inn. This DRM-free PDF is a 416-page collection of the entire run. PLUS it has a special 30-page introduction that shows some rare comics from my high school, college and pre-webcomics years. Here’s a little sample PDF of what you can expect from The Complete Greystone Inn. 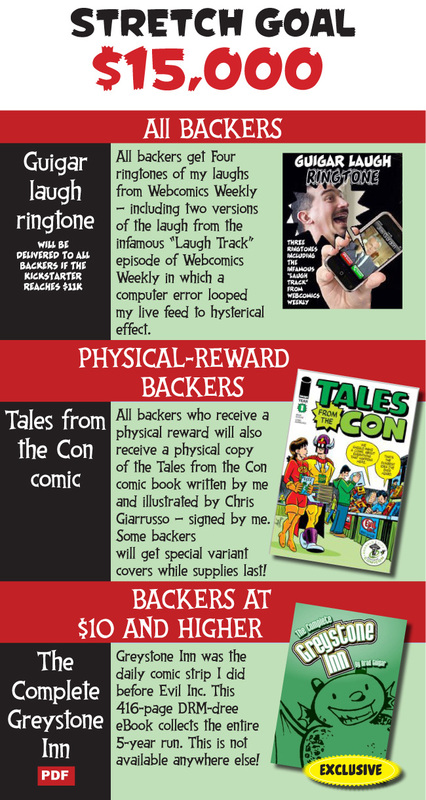 AND, at the $15K mark, all backers who are eligible for physical rewards will get a free signed copy of the Tales from the Con comic book. This is a collection of comics that I wrote (illustrated by the mighty Chris Giarrusso) that lampoon comic conventions, fans and culture. It’s a great read, and if you’ve ever thrown a convention lanyard around your neck, you’re bound so find some stuff in there that hit ya. If you haven’t pledged to support the comic and get excellent rewards in return, click this link and go see what you’re eligible to receive. If you have pledged, jump on your social media (Twitter, Facebook, Tumblr, etc.) and give me a shout-out! There’s no advertising as powerful as that, and it doesn’t cost a thing.